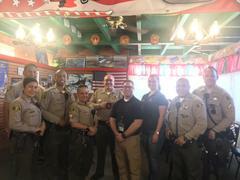 Our station's last Coffee with a Deputy of 2018! Join us, Thursday, December 13th 8am-10am at Crazy Otto's on Ave I. Our last Coffee with a Deputy of 2018! It has been our pleasure to share 2018 with all of our residents. We have met so many new faces, strengthened friendships with our long time attendees and hope we have brought you informative safety tips and community information throughout the year! On Thursday, December 13th, join us for our last Coffee with a Deputy of the year. We will be at Crazy Otto's on Avenue I from 8am to 10am. This month, we will be sharing cold weather safety tips and the #9pm Routine. With the holiday season upon us, we are requesting clothing donations to share with our local charities. We kindly ask for brand new socks and gently worn coats and/or blankets. We look forward to seeing all of you throughout 2019!